WHAT IF YOU DID A DIRECTOR EVALUATION AND DIDN’T TELL ANYONE? That is B/DR-5 of the MNPS school board governance policy. 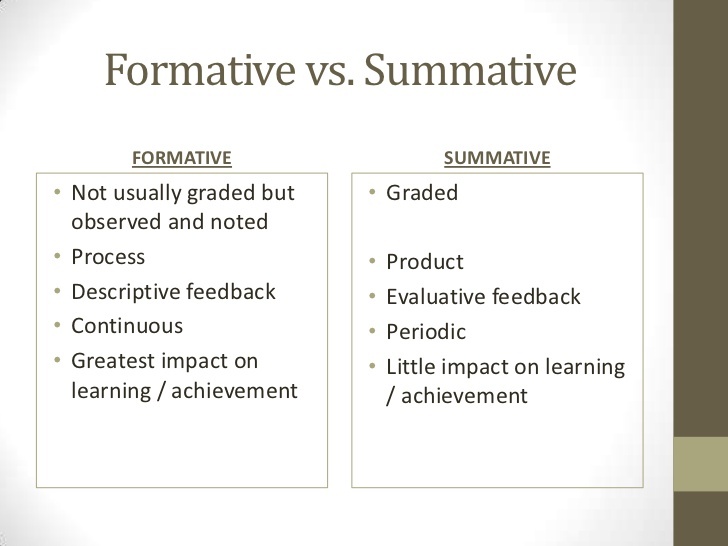 As a public service, I’ll add in the definition of formative/summative in this graphic. I include this chart because back in February – I know, it was supposed to have been done in January, but maybe they did it January 31st – the board performed an evaluation of Director of Schools Shawn Joseph, and in the words of board member Will Pinkston, “I am pleased to say Dr. J has straight A’s.” Which, based on the above chart, would make January’s evaluation a “summative assessment.” But let’s cut them a little slack – this was a newly amended policy and since, under board member Sharon Gentry’s leadership, there hadn’t been an evaluation for two years… this was an improvement. They’d get the second one done on time and it would be a summative assessment. Well, June came, and no evaluation was completed. July came, no evaluation. August came, no evaluation. September came, apparently no evaluation. October came and… wait, what? There was an evaluation in September and nobody said anything? Yes, there was and it was… wait for it… a formative evaluation. Now picture with me a moment, if a student were to turn in an assignment 3 months late that did not meet the criteria of the assignment, what grade would they receive? I’m going to refrain from speculating on why you would do an evaluation and not tell anybody it was completed. I’m also going to refrain from commenting on why I have to do an open records request in order to secure a copy of the evaluations. Instead I’m just going to share some portions of the evaluations, with minimal commentary from me, and allow you to evaluate for yourself. Each board member was asked to offer an evaluation in 5 different subcategories – Board Relations, Community Engagement, HR and Human Capital, Budget, and Communications. I’ll review the evaluations in the same fashion. A little bit of warning here: this is a long post. As much as possible I’ve attempted to let the voices of the board members speak for themselves and for you to draw your own inferences from them. The impact of Dr. Joseph’s efforts to improve board relations cannot be overstated. This has been his greatest strength. Dr. Joseph has managed to unify a fragmented board, and board relations remain exemplary. Through his leadership and guidance, board member relationships have improved. He instituted intensive training provided by the Arbinger Foundation which was received very well by board members. This has directly impacted both the quantity and quality of work that the board was able to produce over the past year. Dr. Joseph tries to lend an ear to each and every one of the member of the MNPS BOE. We are nine very different people all compassionate around the topic of educating our students. That balancing act can make life difficult for him, but he takes our idiosyncrasies all in stride and attempts to respond to our varied needs and areas of focus. As a result of the board’s work with Arbinger, board relations have turned around. I am appreciative to Dr. Joseph for the respect he demonstrates to the board. His work has been instrumental in changing the way board members function individually and as a group. The praise of Dr. Joseph’s ability to unite a board that, in the past, has not been very coherent, is an interesting place to start in our evaluation review. I have to interject here, but my observations of the board over the past year have left me with a very different impression. The board has kinda acted like two parents who pretend that everything is rosy in front of the kids and then proceed to have brutal fights after the kids have gone to bed. The problem is that the kids can always see right through the charade and start to form an attitude of “If you are not telling the truth about each other, what else are you not telling the truth about?” Based on interactions I’ve observed in committee meetings, board meetings, and public appearences, I’d be curious of how many people know where their copy of Leadership and Self Deception is located. I read the book and seldom see evidence of its implementation. In Dr. Joseph’s first year on the job, MNPS prioritized community engagement in an extraordinary way. We’ve undertaken more extensive and robust community engagement than has ever occurred in the history of the school system. In doing so, Dr. Joseph has raised the bar and set the standard for the future. Teachers, parents and taxpayers routinely tell me they’re grateful. Let’s keep up this great work. Dr. Joseph has done a wonderful job of reaching out to and regularly engaging different subgroups/communities in Nashville. Minority communities have traditionally been left out of conversations of significance regarding MNPS. This is no longer the case as Dr. Joseph reaches out to all neighbors, often with a translator(s) in tow. The Listen and Learn sessions are a staple that community members have come to appreciate, and have been used to garner feedback on most large scale decisions related to MNPS. He took on the daunting task of visiting every single school in our district as well as working with many different public/private organizations around the city. Although we as a board did not do a good job of shielding him from inappropriate media scrutiny, he has not shied away from working with the community at large. Community engagement is another strength. Dr. Joseph has worked hard to include a wide variety of stakeholders in our school improvement efforts, which has helped create buy-in to the new strategic plan. As the board clarifies goals and needs, the community will be provided with a roadmap of how to best support our efforts. This should help keep everyone focused on the same goals, thereby increasing our chances of making headway on student outcomes. 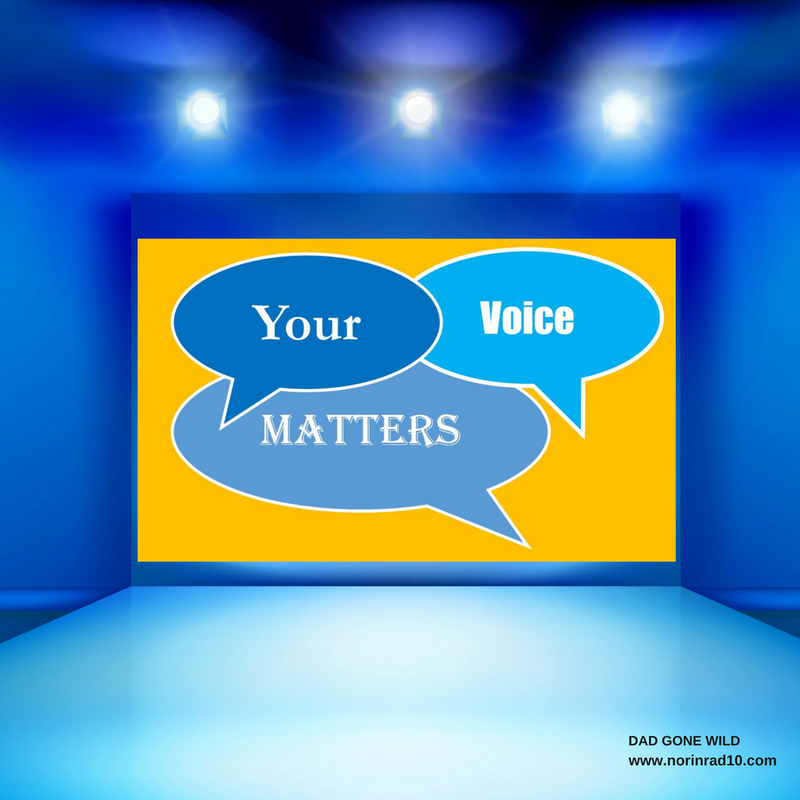 This year, I hope we find more ways to expand opportunities for parent engagement/input and provide more opportunities for informal discussions with teachers, principals and other staff members who wish to be heard. Proactively reaching out to the various facets of the Nashville Community has been a consistent practice in Dr. Joseph’s administration. From large community meetings, to speaking engagements, active involvement in civic organizations, to one-on-one meetings with stakeholders, Dr. Joseph has managed to make and maintain this as a priority. I’m going to refrain from commenting here and just let you form your own opinion. You may agree with these assessments, you may not. I thought that everyone had agreed that the term “human capital” was offensive and we got rid of it last year. Apparently not. Things get a little interesting in this category. Central Office staffing has been an ongoing activity since Dr. Joseph’s hiring. He has surrounded himself with accomplished and highly competent senior level staff. These individuals bring with them experiences and strategies that are “new” to Nashville; not only new to our staff, schools and community but also to us as a Board. There are still vacancies to be filled, and with the budget challenges Dr. Joseph has had the foresight to keep the work at the forefront and contract for the talent that we are still lacking internally. We still have several positions to be filled within our schools, but this is not a phenomena that is unique to Nashville. What is not clear is the strategies that are being implemented to compensate for the shortage in hard-to-staff academic areas and the effectiveness of those strategies. The development of the position of Zone Superintendent was a strategic move that will help get clearer, more accurate and timely resources to our schools and our building leaders. Dr. Joseph has brought diverse and quality leadership to his senior leadership team. There were a number of new senior leaders, and they faced challenges within the school district as he and his team began to change how we do business. His team effectively navigated a complex and political working environment, and they successfully managed change. The new community superintendent structure and providing resources based upon equity has the potential to accelerate our performance. We continue to have challenges recruiting and retaining teachers as is the case across the country. Dr. Joseph prioritized raises for employees, and he created an office of organizational development which will enable us to build the capacity of leaders. Hopefully, these two steps will have an impact on recruitment and retention. Despite the challenges, Dr. Joseph was able to retain 83% of our teachers, with the national average being 84%. My greatest concerns lie in the area of talent and human resources. 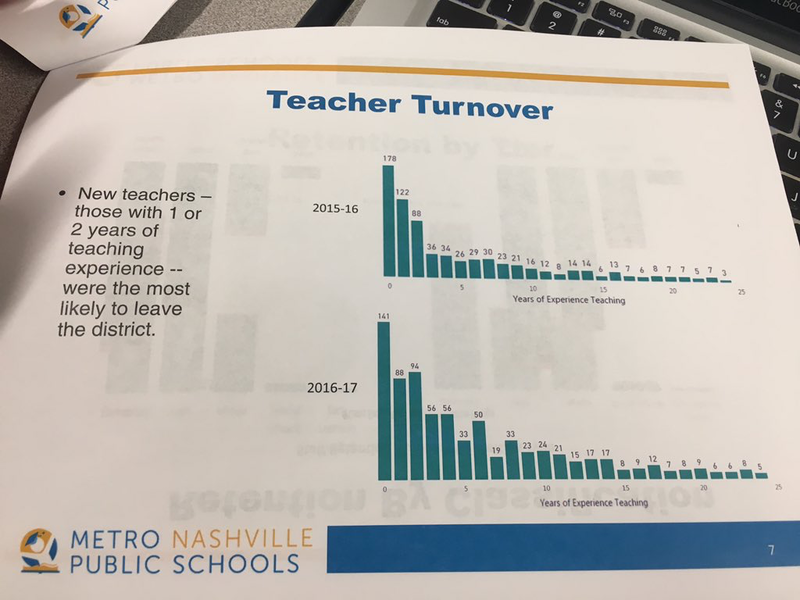 MNPS continues to struggle with staffing (recruitment and retention) and has not found a way to avoid the effects of a nationwide teacher shortage. At our recent board meeting, leaders from Human Resources shared a variety of data that highlight our challenges and offered steps toward potential solutions. Continuing to conduct exit surveys, attempting to address state-level licensure changes, working with local teacher unions- through collaborative conferencing and otherwise, conducting impartial school climate surveys, focusing on competitive pay, and providing forums where teachers, principals and staff members truly feel comfortable expressing their concerns will help to improve our outcomes as a district. I hope that this year, we can elevate the educator voice as we move forward with our plan for improvement. I am concerned that we may not have the right leaders in place to implement our new vision for the district. Effective leadership is vital to accomplishing our goals, and how we manage implementation over the next year will be critical. I am also concerned that at least some district employees do not feel free to speak openly about issues. Finally, I am concerned that some schools have lost large numbers of teachers over the past year, indicating probable leadership issues. Although I appreciate the focus on encouraging continuity in leadership (i.e., avoiding flip- flopping principals) in order to build greater school stability over time, the Director and his staff must also be willing to act swiftly when problems continue and improvement does not occur. Building a great team following longstanding conditions of a rotten organizational culture is incredibly difficult. Missteps and miscues are inevitable when dealing with one of our greatest democratic institutions — public education. This work is, and always will be, imperfect. I’m underwhelmed by some hires, but I trust Dr. Joseph to make personnel decisions and changes as he sees fits. I appreciate the focus on professionalizing the HR office, which is arguably the single most important thing we can do in the Central Office. Please expedite efforts to repair the relationship with SEIU and ensure that we remain on sound footing with MNEA. Happy employees mean a happy institution. Talent will drive the academic change our students’ needs, so let’s keep prioritizing the development of this department. I have a lot to say on this section, but I’ll try to keep things brief. There seems to be an attempt to hide behind a national teacher shortage to justify our shortcomings. I want to make sure that people remember the chart presented at a board meeting over the summer that showed that we’d eased the attrition of first and second year teachers, but four- through ten-year veterans were leaving at an increased rate compared to the previous year. These are experienced teachers; they know what the profession requires. If they are leaving, we need to figure out why. You can’t fill a leaky bucket without plugging the holes. The second point I need to make is in regards to central office. Does anybody really believe that we have upgraded in that area? I keep asking for someone to name me one person who is a dramatic upgrade to the person who was replaced. When you support your literacy program with data from the mid-nineties, there is a problem. When you routinely hire people in leadership roles who have never been in a classroom, there is a problem. When you hire people for positions of leadership who have questionable personal backgrounds, there is a problem. I would urge a deep dive into evaluating whether or not we have the right people in the right positions. This is probably the vaguest category just because of the lack of data to analyze. We’ll have a better picture by the end of the year. But board members did use this category to heap praise on Dr. Joseph. After working in and around governmental budgets for more than 20 years, I am continually impressed by the transparency and logic of the MNPS budget process. I commend staff who, each year, “turn square corners” on a complex budget that represents more than 40% of spending in the Metropolitan government. Moving forward, we need to do a better job making the case that MNPS is a chronically under-funded school system. Part of this is due to inadequate state funding. Speaking plainly about this problem is the first step to resolving it. Let’s discuss a strategy for better advocating for adequate resources to support our students and teachers. The budget priorities are clear as they align to our strategic framework. I appreciate that Dr. Joseph honored his commitment to fund a 3% employee salary increase even after we learned Metro Council would not likely fund our requested budget. The number of out-of-state consultants gives me reason for pause; however, I am pleased that Dr. Joseph has placed a high emphasis on early literacy and look forward to hearing how the various consultants’ are correlated. Given the approved amount of our ask, I believe that Dr. Joseph and his teams have made sufficient adjustments and done an amazing job of working with the resources at hand. Again, I don’t have a lot to add here, other than I would advise treading very lightly on blaming budget shortcomings on the mayor. But hey, apparently, that’s just me. The communications department was the hardest hit by turnover last year. Familiar faces like Joe Bass, Hank Clay, Janel Lacy, and many lesser known but equally important employees left to explore other options. Are their replacements an upgrade? Well considering that reports are starting to circulate of the Public Information Officer feuding with half the local reporters in town, not to mention various department heads in Metro Government, I’d say the jury is still out. This is the area where most board members took their shots. The communications department has had lots of changes this year, and this instability has caused inconsistent communication at times. Dr. Joseph should continue to focus on staffing the communications department with strong individuals who will begin to communicate more concisely and more proactively with the community. Over the past month, with the addition of the new PIO and communications specialist, I have seen improvement in the number of positive stories that have been communicated about the school district. He should continue to focus on highlighting the positive stories within our school district. Seeing positive changes since recent new hires are filling in the voids left in the spring & summer. Ongoing changes in the communications department over the last year have caused difficulties for the district. However, it appears that MNPS now has the right communications staffing in place to move forward, and communications are improving. I am hopeful that the communications department is now stabilized, and district communications will continue to improve. MNPS Communications has left a lot to be desired over the past year. Though there may have been competent individuals working in the department, there was not a dedicated team effort to supporting all the needs of the district. Some of these issues have only recently been rectified, but there has been effort (multiple job postings, new hires, etc.) to build a cohesive team. The current department staff have been engaging the community more regularly and more proactively which is a definite plus! It seems that the board universally feels that the previous communications staff didn’t tell enough “good” stories and that the newer staff members are rectifying that situation. I would caution that there is more to quality communications than just “telling good stories.” If you want to get a read on the quality of communication in the district, I suggest talking to a few principals about the rollout of the homework policy, the grading policy, and the literacy scope and sequence. I would suggest talking to teachers about the clarity of expectations and the communication of district discipline policies. Just telling good stories may make you feel good, but they can also serve as a distraction from what’s really transpiring. We need to always remember that one individual story does not translate into the whole story. While our successes should be celebrated, we need to make sure that the opportunity to create a good story is available to ALL kids. I must admit that upon initially reading these evaluations, I was a little discouraged. The disconnect between the school board, and for that matter Central Office, and what is transpiring in the classroom is very disconcerting. This whole evaluation was primarily centered on Dr. Joseph’s impact on adults. Very little was said about his interactions and impact on our students. Several board members mentioned that Dr. Joseph had managed to visit every school in the district. Wonderful, but when did that become a cause for celebration and not an expectation? Running in and touching the building shouldn’t count as a visit, and all too often that’s what happens. As I’ve gone through these evaluations and read them deeper, some of my discouragement lifted. There are signs that the disconnect is not as wide as it often feels. There are signs that board members are beginning to openly question things. Unfortunately, there is also evidence of factors besides excellence bearing undue influence. The importance of closely monitoring the director’s actions can not be overstated. Get this wrong, and it could be a decade before the district recovers. Think I’m being hyperbolic? I urge you to study the Garcia years. Study where MNPS was in 2009 when Register took over and where we were in 2016 when Joseph arrived. One was a crisis, the other was a launch pad. I want to leave things with that warning, I tried to keep board member’s words in the context they were offered. At times, I had to edit for brevity. It was never my intention to paint anybody as wrong or right, but rather merely to inform. I would argue that had all these reviews been released a month ago when they were completed, my sharing would not have been needed. If you’d like your own copy of the reviews, drop me a line at norinrad10@yahoo.com or you can request a copy through MNPS.